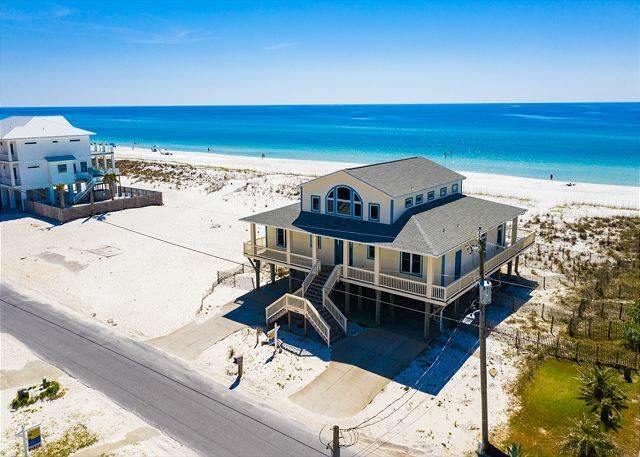 An ideal house for small events, this 2,920 square foot home sleeps up to 14 people and is directly on the Gulf of Mexico. The front entrance at 1004 Ariola Drive, with its grand double staircase and wrap around porch, leads into the open and spacious kitchen, living, and dining area. 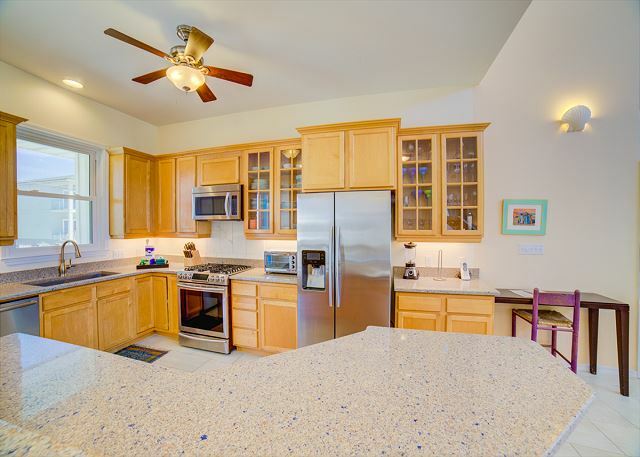 The kitchen, furnished with stainless appliances, lots of prep area, and a large breakfast bar, opens up into the living/dining space. This space includes three comfy couches, an arm chair, and a dining table seating up to 10 people. 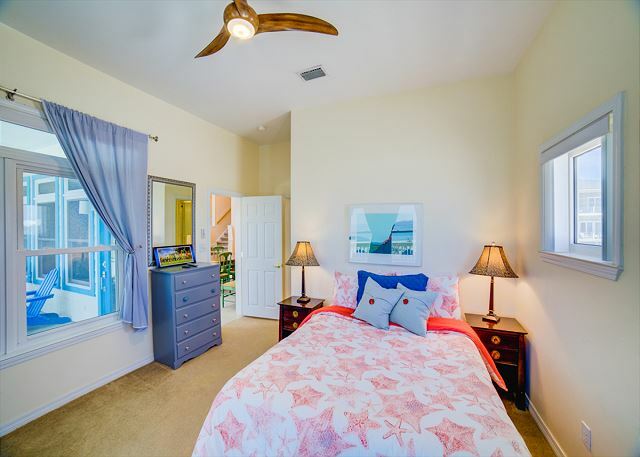 The master bedroom is located off the living area. 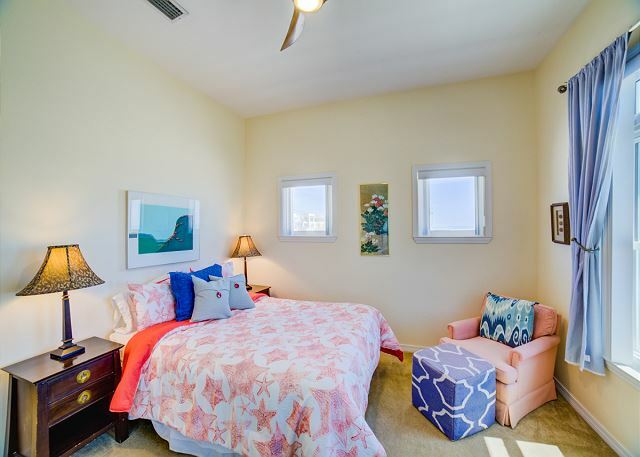 This bedroom opens to the Gulf side deck, and the huge master bath features two pedestal sinks, separate shower and garden tub, and an oversized walk-in closet. 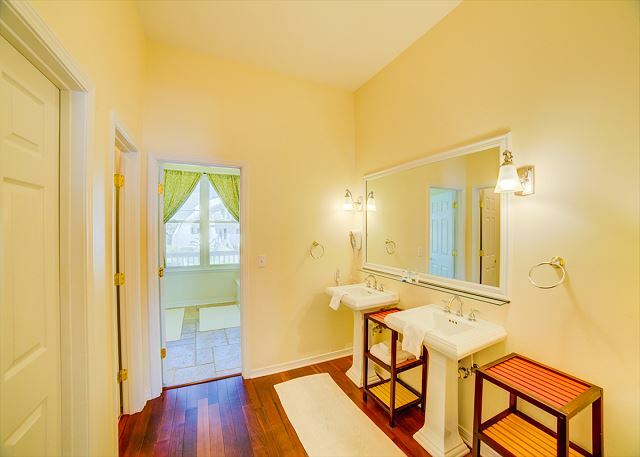 A short hallway past this bedroom leads to a large laundry room. 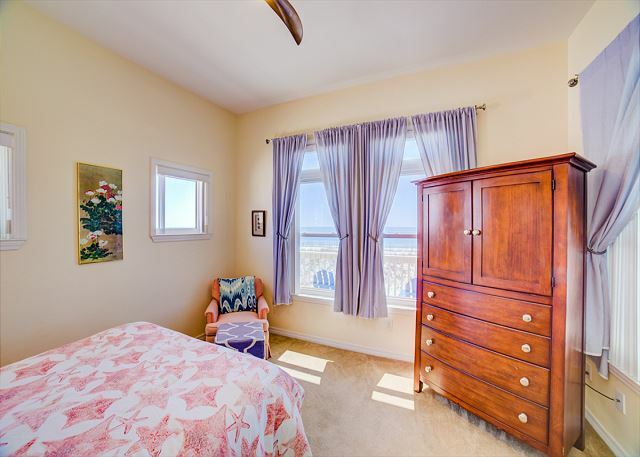 Across the living room, bedroom 2 has a queen bed and large private bath. 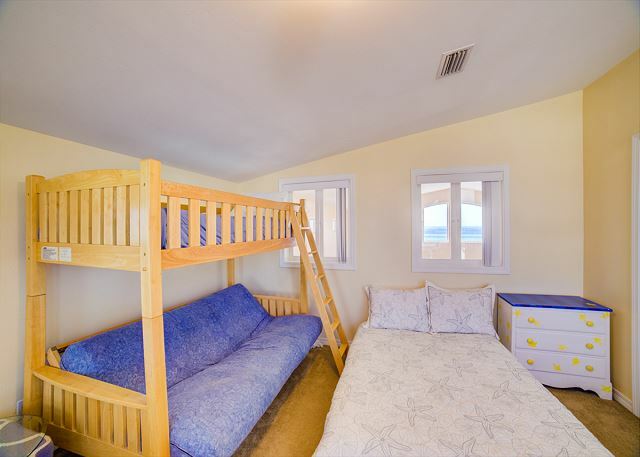 Bedroom 3 has two sets of twin bunk beds. Here there is a large hall bath that also services the living area. 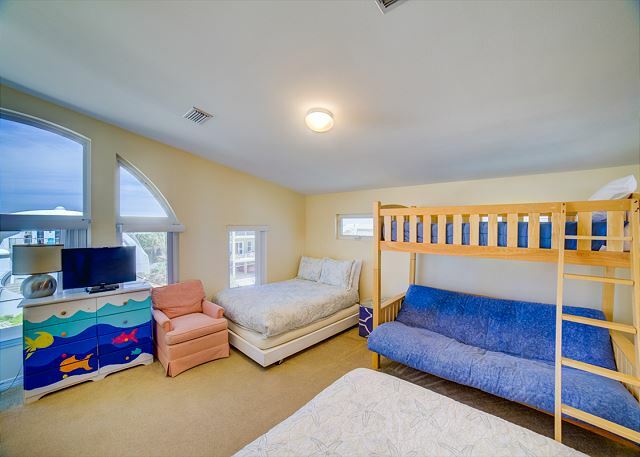 Bedroom 4, also known as “kid paradise,” is located up the stairs on its own upper level. 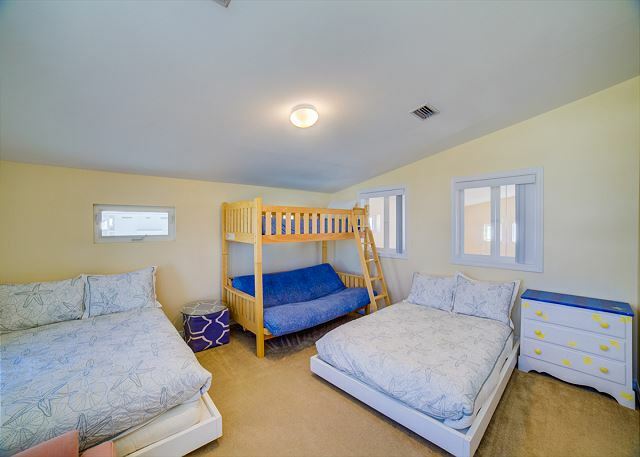 This bedroom has a twin bed, another bunk bed with twin on top and queen on the bottom, and an additional queen bed. The windows in this bedroom overlook the great room downstairs. 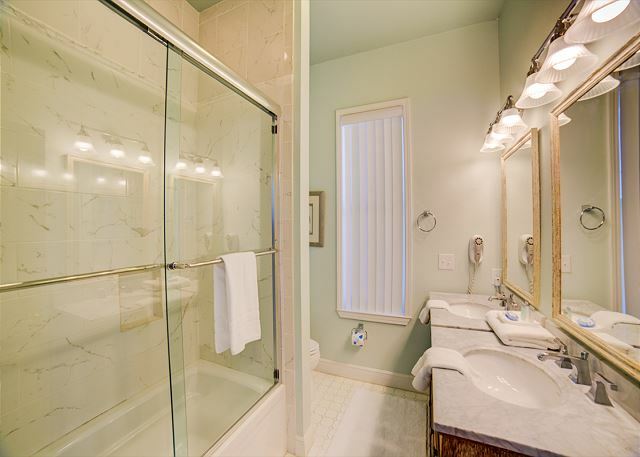 The large hall bath has a double vanity and the arched windows on this level make it a very unique space. The Gulf side deck offers a full sized dining table, a grill, and lots of seating. There is an outdoor shower and the covered area below the house is large and open for lots of parking or event space. Awesome home, view, and location. We had a great stay at 1004 and hope to return next year. With that said, we did experience some AC issues. The upstairs ac unit for the loft bed room had a coolant leak. The staff at Paradise Homes had a repair crew at the house in a few hours and the unit was fixed promptly so the upstairs AC issues were resolved. The main floor bunk room does not get enough cool air so the temp in that room is consistently warmer than the rest of the house. 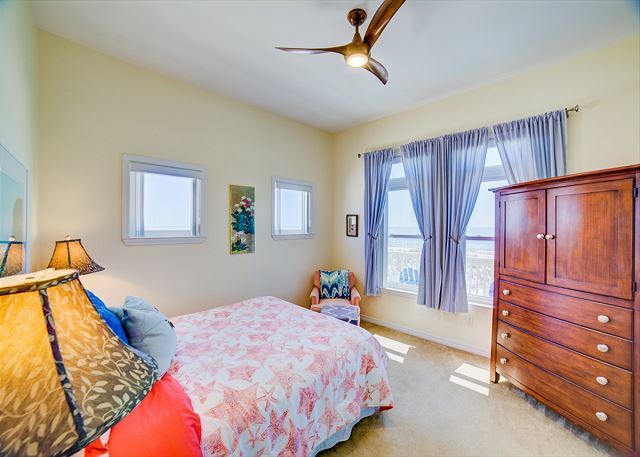 There are several fans in the house and ceiling fans to help keep that room cool. The rest of the house was fantastic. The kitchen was well stocked with pots, pans etc. The property was clean and well maintained. Really enjoyed the open space and view. The evenings on the deck were just awesome! We had a great week. Thank you for taking time to post your review. We are so glad that you enjoyed your stay and we look forward to your return! The House was amazing. We could not have been happier with the spacious and covered porch. The bathrooms having double vanities came in handy with all us girls. Location was close to all the restaurants and bars. The only complaint we had is the room with all the bunk beds downstairs was very hot. So bring a fan if you get stuck in that room. But with that said we would 90% stay here again. The location is perfect.... the house could be perfect ...if only the a/c were better! We could not use the upstairs at all due to inadequate a/c. The temperature never went below 75 at night and 78 in the day.... the kids could not sleep there. It was still a fabulous vacation but a little uncomfortable at times .. I would still recommend it !!!!!!!!! This place is way nicer than the pictures! We are pleased to hear you enjoyed your stay at 1004 Ariola. We hope to see you again soon! We were very pleased with our House Rental! We tented this location for our daughters wedding. Paradise Beach Homes was more than cooperative with any info we needed. Even gave our wedding couple a beautiful frame to remember our stay. We would highly recommend this as a wedding benue. Our AC even went out the day of the wedding and they were bery prompt to send someone over immediately to repair. Thanks for wonderful memories. Awesome house and great service! The only issues we had were that there was no ice from fridge, the king master bathroom had bugs and worms coming from the drain in the shower and the air seemed to not be working the last day or so. Other than that, everything was perfect! The deck is more covered than it looks and was perfect to still be outside when it rained. Our family of 11 rented this property because of the location to the beach and the space needed -you couldn't get any closer to the beach and everyone slept comfortably. We were happy with both. 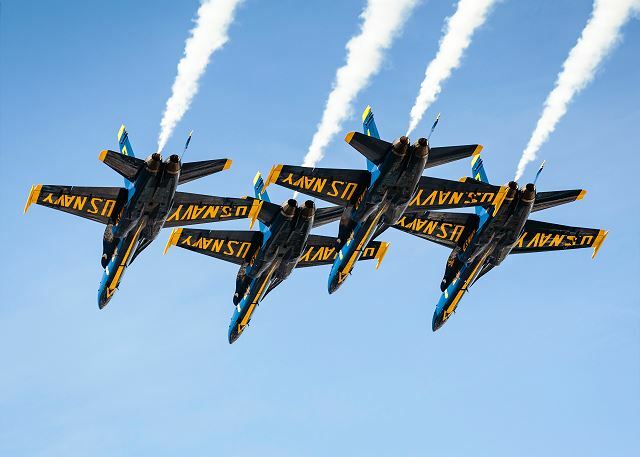 While vacationing there, we went parasailing, watched the Blue Angels perform (they flew over the beach on 3 occasions) and ate at Shaggys, Crabs, and Peg Leg Petes - All had great food. We have been taking these family vacations for 7 years and this was voted the favorite so far. WE would absolutely recommend 1004 Ariola Dr. to our friends!! I rented this house for Spring Break. My son and several fraternity brothers came as well as a friend of mind so we could always have an adult present. The house is beautiful. It. Is very spacious and comfortable. 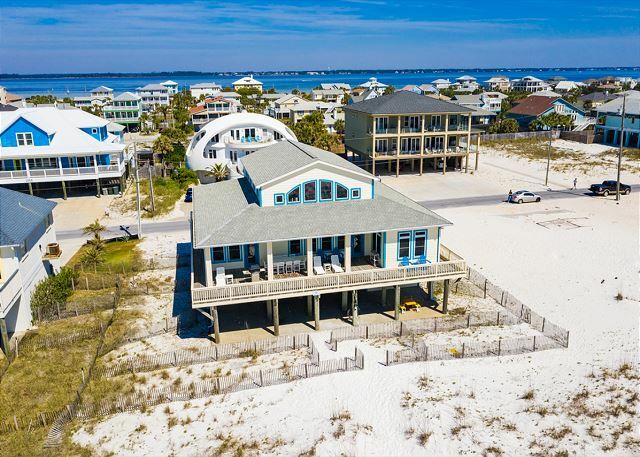 It was a great place for several 19 -21 yr old because they could really spread out between all the bedrooms, the beautiful and large back porch and the beach right there. We all had a wonderful time without incident. Everything about the house was perfect. The open floor plan allowed my large family to gather together while preparing meals so nobody missed a thing. The house is beautifully furnished including two large dining tables that seated 10. It's location directly on the beach was perfect. My only suggestion is to include a rocking chair for rocking the babies. It was a great trip. Beautiful home and great location. We forgot an iPad and headphones. Housekeeping turned them in and Paradise Beach Homes shipped them to us. I would use this company and go to this house again. 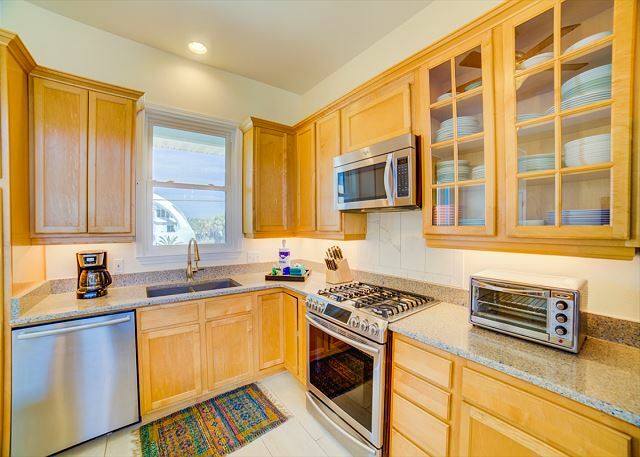 Great location, very nice bathrooms, fully stocked kitchen, and great kitchen! The entire experience from start to finish was a+. The staff were professional and friendly and the home had some very nice upgrades done since we originally viewed it. We held our wedding with 45 guests here and could not have asked for anything more for our special day!!!! AMAZING! What an excellent experience we had with this company and with this property. Both were wonderful. Thank you!! Check in was a breeze! One window was left open (perhaps needing repair) & the staff wrote the information down without interrupting our stay. Any thing we needed was in the home! 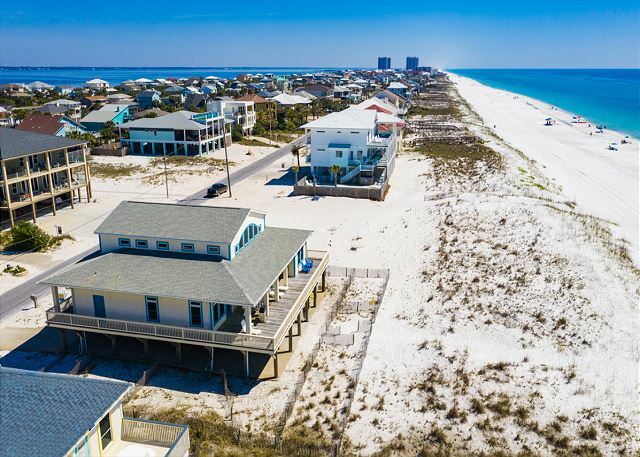 When you look at this picture, it shows your home directly on the beach - IT IS! We had a WONDERFUL stay. The house had everything we needed. Definitely enough room for up to 14 people!! 2 beach chairs were even provided (which we did not use because we brought ours). The only downside?? The beach is a public beach. People will park right in front of your home and set up their chairs where you would feel yours should go. We just placed our chairs out there early and left them until early evening then brought them in. That way, we were assured a spot on the beach - at the home we rented! Would ABSOLUTELY RECOMMEND this home! The house was tastefully decorated and the floor plan was ideal for our family with Mom, Dad, three adult children and their significant others. You can't get any closer to the beach! Loved it! We held our wedding reception here and it had all of the amenities we needed. 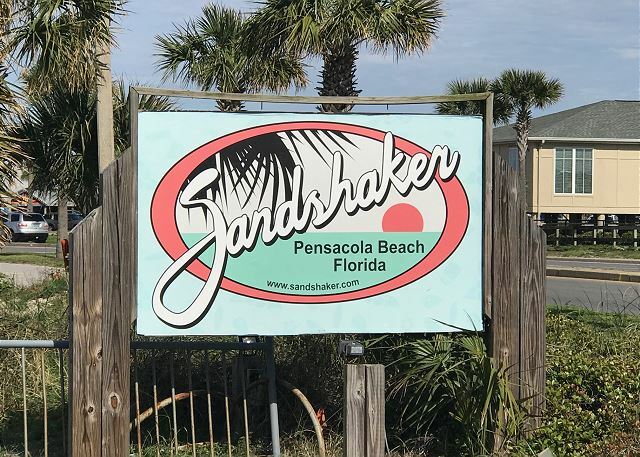 Paradise Beach Homes was very attentive to our needs with the party permit and calling an electrician when the outlets for our string lights weren't working. All of our guests were telling us it was the 'best wedding ever' and the party continued the next day on the beach! 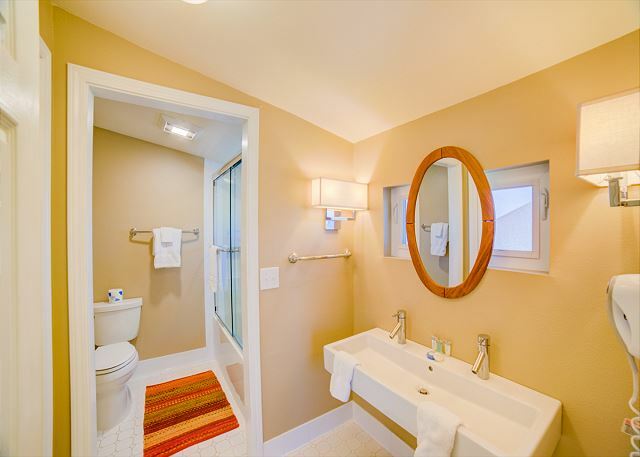 The bathrooms in this home are absolutely beautiful, kitchen large enough for everyone and access to the house was very easy from all of the hotels in town. 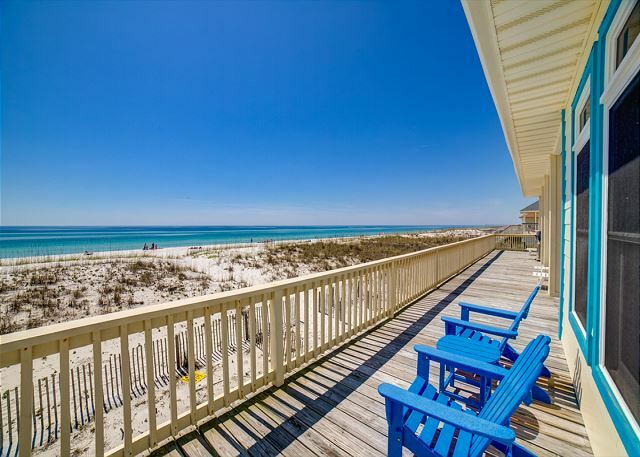 I highly recommend renting with Paradise Beach Homes and this home spcifically. Lots of room for all of us - the porch was great - the weather windy but sunny - had a great week! Beautiful house , perfect location. We have stayed at this house at least 4 times now. 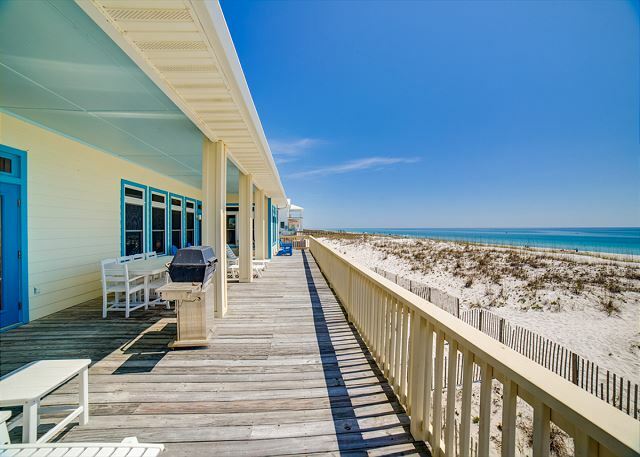 Gorgeous home, best deck on the beach, we love it! Will definitely be staying here again! This home is ideally located. Kitchen was nice. Great room was nice. Bedrooms had inadequate air conditioning. Lots of little things wrong. Fans, lights, outdoor plugs, grille are not working or in terrible shape. For the price, I expected more. Location is great. Layout of house is great. Shower door was broke when we arrived, freezer door handle was off of freezer when we arrived. Upstairs shower was too dirty/filthy to use, sand in carpets when we arrived, large amount of dust on kitchen ceiling fan. House needs a deep cleaning. This is the 4th year or so that we have stayed in this house. Each year there has been a problem with the a/c not cooling the bedrooms downstairs sufficiently. We even brought a fan with us this year for one of the bedrooms. The interior of the house was freezing (69 degrees) and the bedrooms were soooo hot (78 degrees -- yes it was checked). Also this year there was nothing and I mean nothing in the cabinets. Always before there would be salt and pepper, various spices, maybe some plastic wrap --- but we even had to buy salt and pepper!! The house is becoming noticably 'used'. The shower door upstairs does not work properly, the freezer door handle fell off. Also the outside shower === someone replaced the shower head and so it is a very light shower and then glued (if that is possible) a hard spray nozzle on the hose so you are stuck with hard jet spray to rinse your feet. The covered porch is our favorite place in the house. Even with all of the negative we will be back next year as the house is a wonderful house. Just beware. Every year we hope the a/c will have been reworked. The view was spectacular, awesome location! We hosted our May 2, 2015 wedding at this wonderful beach home. The weekend was perfect! 65 of our closest friends and family joined us. 13 people stayed in the house for 3 nights with us. The house is very spacious. We all had privacy while being able to gather together for dinner at the huge table or on the back porch. The house was well maintained and featured countless pots, pans, utensils, bedding options, and more. It was much better stocked than any condo we've ever rented. We hosted the entire wedding underneath the house. There was plenty of room, lots of electrical and water options, and beautiful views! An absolutely perfect venue for rain or shine. We had 7 different couples staying with us and we all had a wonderful time! 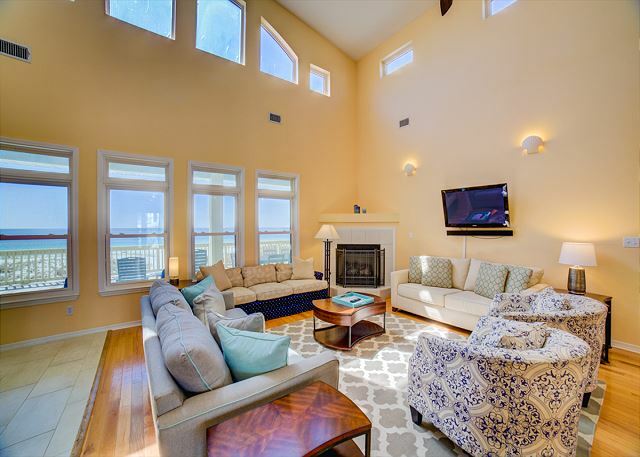 We would definitely recommend this home for a vacation or special event. We were even able to have our dog join us for the festivities as the home is pet friendly. You would never know though. The house was imaculate and show no signs of wear and tear. 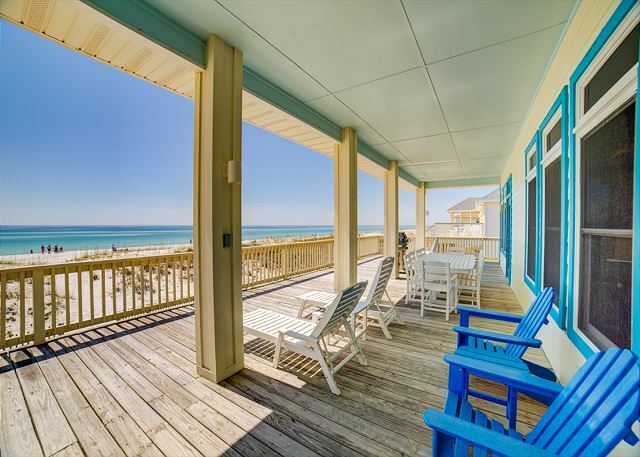 We rented through paradise beach homes and will use them for our next trip to pensacola. The hospitality we received from the time we first scouted homes to the checkout was unbelievable. Their staff truly cares and anticipates your needs. We even received a beach bags full of goodies and a special wedding gift at check in. I cannot rave enough about the PBH service. They were simply wonderful! Overall, we had an amazing experience! 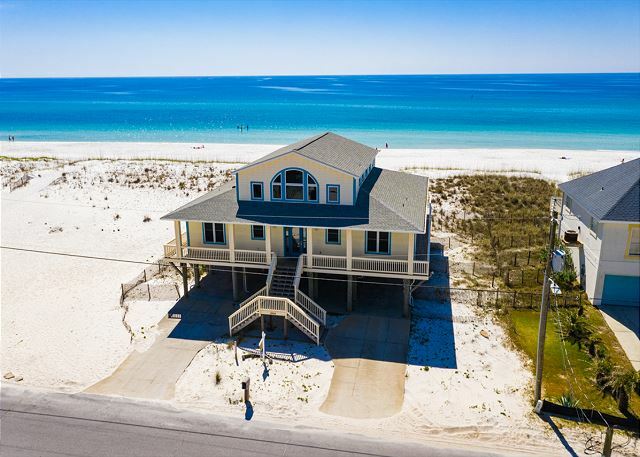 This house is awesome has everything you could want in a vacaton rental.when I go back to Pensacola I will definitely try and stay here. 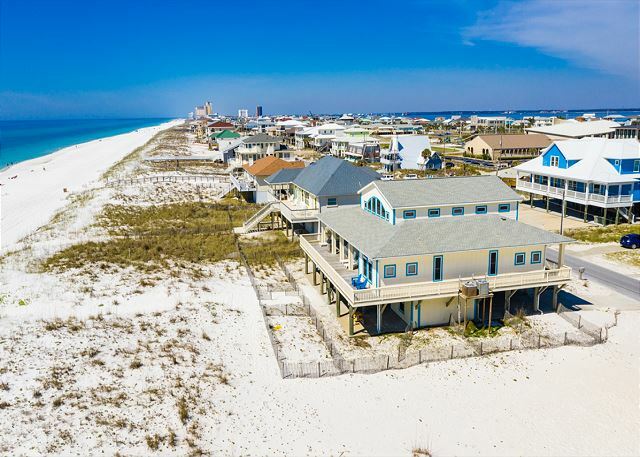 The house is right on the beach . Paradise rental was excelant to work with they even furnished you a goodie bag upon arrival. Had wonderful few days at this lovely home. It made our stay for a close friends wedding memorable. It was awesome. The house is beautiful and accommodating to my large family. There was plenty of space for the reception underneath the house and easily accessible to the beach. 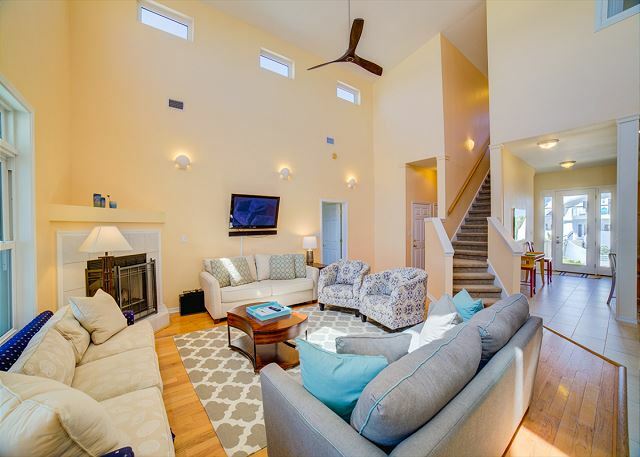 Lovely home for hosting parties or family gatherings. We hosted a 3 day wedding rehearsal/reception here. I was very pleased with all the kitchen supplies. The view and sunset were spectacular! Between the balcony, the house and concrete lower level we comfortably had room for 100 guests. It's a wonderful house to play and stay. My vacation was too short! We love, love, love everything about our rental experience. Well except that we only had a week! The house is gorgeous, this was our 3rd stay here, the rental company is super responsive! We love everything about it! We have stayed at this home 2-3 times and it is perfect . 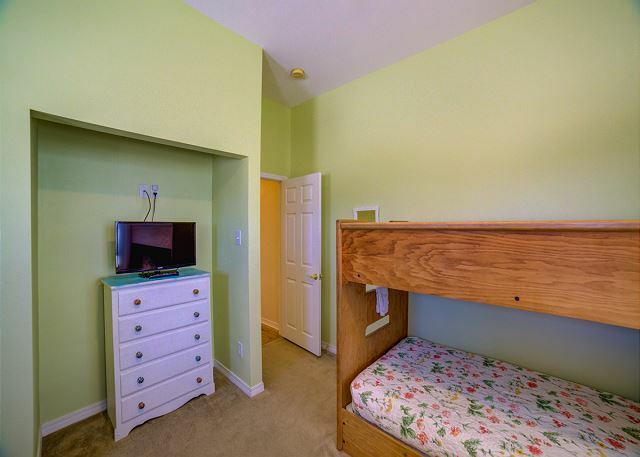 Very well decorated and plenty of room for our family. The partially covered deck is perfect and the view outstanding. I have rented this house for a few years now. I love everything about it -- they even gave it a makeover this year with new furniture and such -- even new ceiling fans I think. I love the hot/cold outside shower. BUT, there is one problem and some people might even consider it a game changer --- the main floor a/c is not sufficient to keep the bedrooms cold. We kept all of the fans going and slept with our doors open trying to get the rooms cooled down. There was at least a 5 degree difference between the main area and the bedrooms. This was nothing new, it seems like it is this way every year -- we just brought extra fans this time. The upstairs a/c will freeze you out! My daughter and her entire wedding party including groom stayed together and enjoyed the beach and the wonderful deck on the back of the house when it rained. Thank you for helping us create a "once in a life-time" experience for all of them!!! 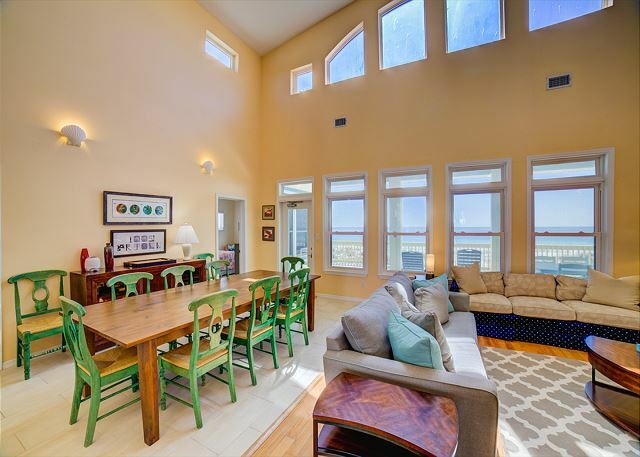 great home and great view here, weather was great...but beach access and catholic church make traffice unberable on ariola. beach quickly loads up with people, dogs,trash,ect. We enjoyed our stay, and look forward to experiencing this all over again in the near future!